I woke up this week, looked out of the curtains, and went back to bed. It was raining. Again. I don’t know about you, but although I don’t usually mind winter weather, I’ve had enough, and want to feel some sunshine again. Luckily, later in the week, I did just that with a visit to perhaps my favourite venue, Rode Pool in Cheshire. 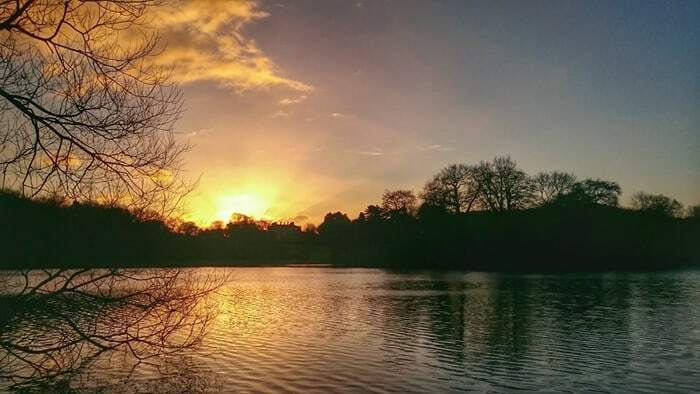 It’s just one of a fine portfolio of waters on the Stoke-on-Trent Angling Society card, an ancient estate lake covering forty odd acres, renowned for tench and bream, with a head of carp I’m led to believe numbers just over one hundred, which are notoriously difficult to tempt. After fishing it hard last season for the tench and bream, this year, I’m determined to catch one of the elusive carp, so I was really looking forward to a session this week. It’s a typical Cheshire estate lake, silty, large bloodworm beds, surrounded by Dogwood, sedge and rhododendron, and nestled amongst woodland. It’s a haven for bird and wildlife but has a reputation as a tricky water. Indeed, many anglers, despite a few visits, have yet to catch a fish of any description from the clear waters, but in spite of it’s trickery, it’s a place I’ve fallen in love with over the past couple of years; it’s the one place where I really enjoy my fishing… It’s days only too, and with only a third of one bank available to set up on, it can offer a challenge! I love it! It can also be a moody water. Changes in air pressure, wind direction and water clarity all have a huge impact of the residents, as does angling pressure, so to catch a carp is a real achievement, and one I’m hoping to accomplish fairly soon, so it was with carp in mind that I ventured forth. It’s a two rod rule on the water, so I opted for my Sonik Vader X rods, which, with a 2.75lb test curve, to give me that extra little bit of power to hit the far bank reed line at around eighty yards. Last year, I elected to use the S3 1.5lb test curve rods to fish a little closer in, but for greater distances, I needed a bit more backbone… the Vader X are superb value, and perform the task admirably so are perfect for the job. From other anglers with far more knowledge than I, I’m told that Rode Pool doesn’t respond particularly well to large beds of bait, not least because the resident waterfowl can see it, and have no compunction about clearing it up as fast as you can put it in! As a result, I use free offerings very sparingly, and whilst fishing last year, used none at all, preferring to use a method feeder approach to put bait on the spot. 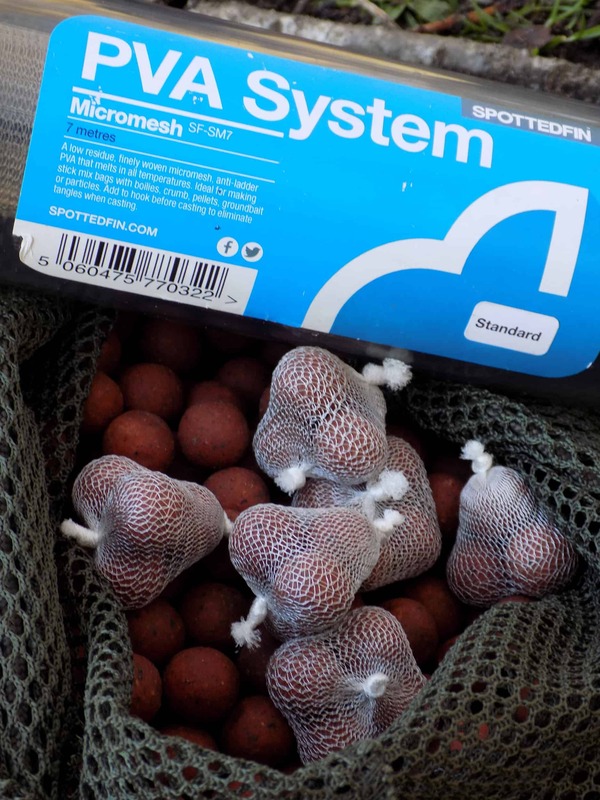 This year, most of my angling will be done with bite-size bags comprising four or five baits, to offer a mouthful and no more. If I get a chance, I want the carp to find my hook bait, not a load of freebies! Dark baits are apparently the way forward, providing an unobtrusive platter of fodder for the unsuspecting target. 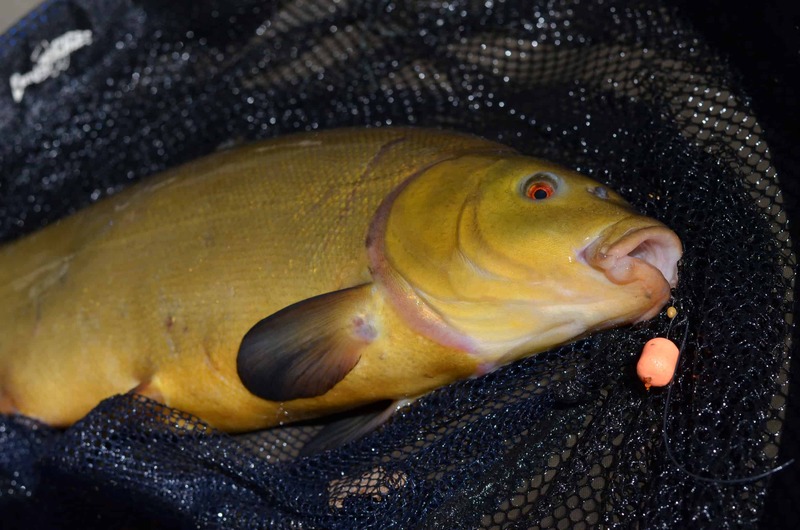 I’ve found already that using brighter, lighter baits does tend to gain less piscine interest, and I put that down to fish being unwilling to silhouette themselves over lighter groundbait to the waiting birds of prey above. The woods are full of heron nests, there are buzzards and cormorants too, so it pays to blend in! I’ve been over much of the accessible water with a Deeper Pro+ sonar during the colder months, and the mapping feature allows me to look back at the data to determine exactly what I’m fishing over. For the most part, the venue has a fairly uniform depth, with some hard spots, and plenty of softer ones, so once identified, it comes down to other deciding factors, such as wind direction and the track of the sun. 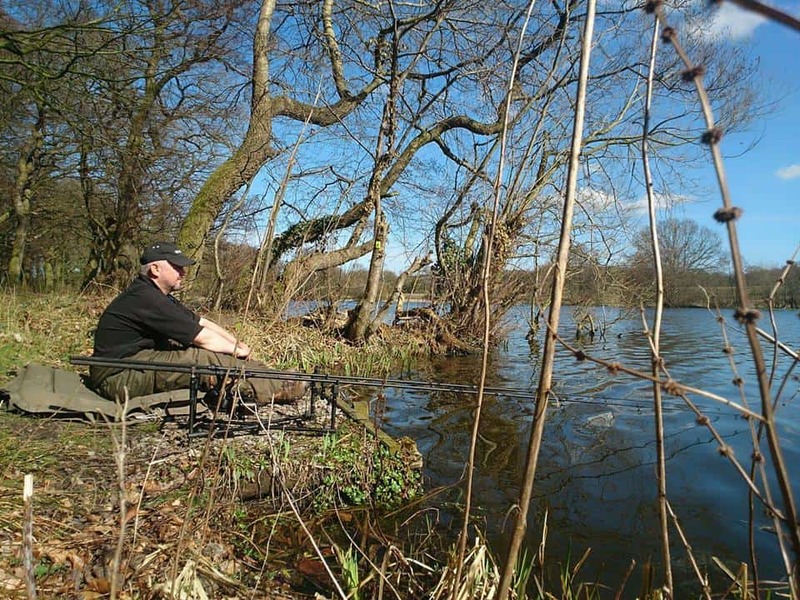 As I’ve mentioned, it isn’t deep, so the sun can have a real impact within a few minutes, and I chose my peg knowing that the water would be quickly warmed in front of me yet would retain an area of inviting shadow in front of far bank cover; an ideal interception zone. For once the weather forecast was reasonably accurate, and within a few hours, the sun was high, and I could feel my cheeks burning as the sun shone strongly. Other anglers had set up much further down the lake, fishing into a chill wind, but I was in shirt sleeves, enjoying the sun on my face, hidden amongst the woods… blissful! I watched the water intently, but saw no signs of fish at all, with the exception of grebe which surfaced with roach pinched in their beak. It didn’t matter, it’s that kind of water, and I enjoyed watching kingfishers zip across the surface, coots and duck engage in mating battles, buzzards swoop, and all manner of woodland birds chatter as the day passed. Eventually, as I watched my bobbins, one of them rattled towards the alarm, and the receiver buzzed to alert me. I was on the rod quickly, sweeping it skyward to pick up all eighty yards of line and connect with the fish. 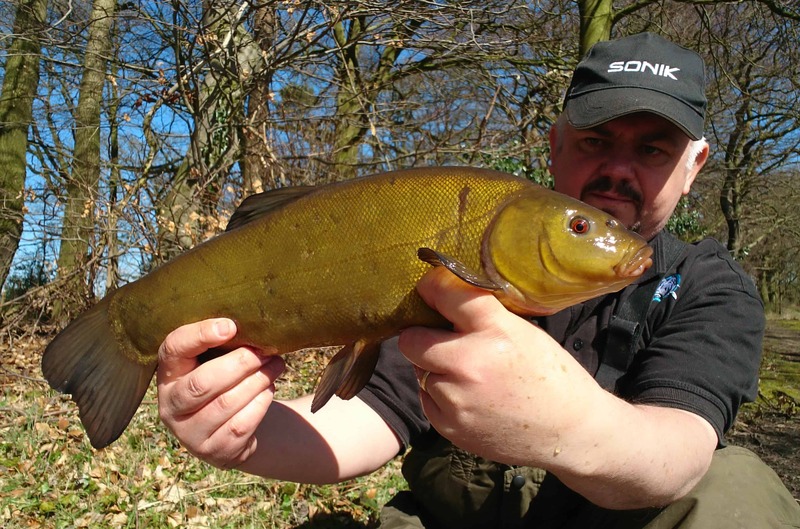 Instantly, I could tell it wasn’t a carp, but instead one of the fine green tench for which the water is famed, and it was quickly defeated, safely netted, photographed, and returned. It had picked up the spicy Masala wafter, an orange bait amongst the freebies, and this fact was quickly noted in my book in an effort to compile the ‘bigger picture’. Recasting the bait, I sat back to enjoy more tranquillity and was surprised when just a few minutes later, the bobbin on the same rod was snatched upwards sharply. I watched intently, but it moved no more, so I can only put it down to one of the bigger roach being unable to deal with the size of the bait and dropping it. Sadly, the solitary tench was my only bankside visitor and as the temperature plummeted as the sun disappeared behind the trees, it was time to pack up. Between five anglers, I’d had the only fish of the day, and although it wasn’t the carp I’d hoped for, it was a positive start to my campaign as I love catching tincas too! None of us had seen so much as a glimpse of carp either, which was disappointing, but to be truthful, their absence just adds to the allure of the place, giving it an extra sense of mystery… where could they be hiding? Are they feeding yet? Has anyone else caught and keeping it a secret? I’m hoping to fish it at least once weekly for the next few months, so this column may well become a record of failure… or a beacon of success! I can only hope it’s the latter, but I’ll let you know!